After a month of mostly disappointments, we get The Man from U.N.C.L.E., an awesome, wildly entertaining action flick. 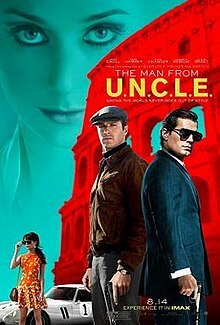 Guy Ritchie takes a ’60s spy television series and brilliantly turns it into a Bond-style thriller that’s loads of fun. Henry Cavill is a great protagonist, and although his personality is not completely convincing, mainly because he’s a Brit playing an American, he has great chemistry with Armie Hammer, who also does a great job. Alicia Vikander is very good too. Since she made her breakthrough with Ex Machina this year, she has been very pretty and attractive in all her roles. However, she feels like a cliche damsel in distress by the end of the film. Elizabeth Debicki’s villain is also slightly predictable, with her motive not being completely clear, besides wanting to continue a criminal family business from past generations. Hugh Grant does a great job but could’ve had some more screen time. Nevertheless, I was mostly entertained by the movie’s cast. The movie’s action, like other action films this year, takes it to a completely new level. There isn’t too much action within the first hour, but there is still plenty of action during the run-time of the movie. Whenever the action came on screen, I found myself entertained out of my mind. The action is amazingly coordinated and brilliantly shot, not to mention the awesome soundtrack that gives the movie a ’60s feel. The way the movie’s story is set up is great. The movie altogether entertained the hell out of me from the beginning to the end. It’s not your typical cliche action story except for maybe a plot point or two. It’s not as cheesy of a movie as it seems, and is much better as its approach with marketing. Like I’ve mentioned in previous posts, 2015 has been an excellent year for action movies. Kingsman: The Secret Service, Mad Max: Fury Road, and Mission: Impossible – Rogue Nation all defied expectations and were awesome in their own ways. Now, The Man from U.N.C.L.E. is one of those films. With its action, directing, cast, and soundtrack, it makes an awesome popcorn flick definitely worth checking out on the big screen. This entry was posted in Action and tagged the man from u.n.c.l.e., the man from uncle. Bookmark the permalink.